Leeds NW Greg Mulholland 2907 LD 2000 6.2 ? ? ? Luton S Gavin Shuker 5711 LAB 3000 ? ? Plymouth Sutton Oliver Colvile 523 CON 1000 3.3 ? ? Under the terms of the current (“2018”) UK parliamentary boundary review, Scotland will be entitled to 53 seats at Westminster. This report describes the possible new geography of those 53 constituencies, and should be read in conjunction with the official rules and data. If you’d like to make an informal comment about any of the seats, please click on “Leave a comment” at the bottom of this page. If you’d like to make an official response to the boundary commission, about this plan or about your own ideas, email bcs@scottishboundaries.gov.uk before the end of 2016. The exact entitlements for various areas are shown on this map. In theory the Central area “owes” the Edinburgh/South area a ward, but the judgment call has been made that crossing the boundary for the sake of a few thousand voters would be too disruptive to the overall pattern of seats. As well as the island seats with protected status, namely Orkney & Shetland and Na h-Eileanan an Iar, this area includes the Highland, Moray and Argyll & Bute council areas. 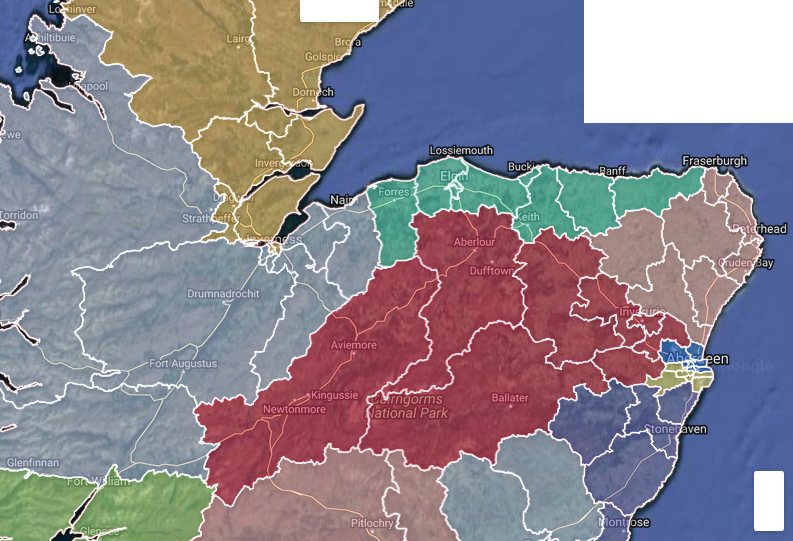 There is a legal limit on the geographical size of the seats in this area, and probably the best way to keep the seats within that limit is to divide Inverness between the two Highland seats, and include Badenoch & Strathspey in the Moray seat. Note that Lochaber is now split between the Argyll and Inverness-shire seats. If it’s felt that Caol should be in the same seat as Fort William, it can be added to the Argyll seat. Names: if possible it would be good to come up with properly representative names for the two Highland seats that are not too cumbersome. Unfortunately since the Moray seat would be illegally large (in terms of electorate) otherwise, it’s necessary to include a small area – Rothiemay and Grange, near Keith – in the Gordon seat. 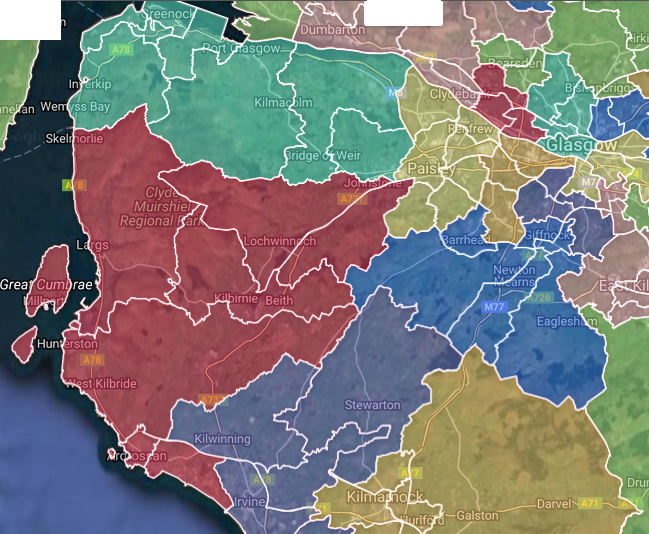 Although it’s possible to arrange the seats north and east of Aberdeen without dividing a ward (see here), this would create a 3-district seat stretching from Aberdeen to Kingussie. Dundee is too large for one seat, and the Broughty Ferry and Fintry areas are included in the Forfar seat. The Montrose seat includes Arbroath and Stonehaven. Aberdeen City is just the right size for two seats. Although the North Fife-South Perthshire seat is something of a novelty, at this review it’s the only elegant solution, given the relative sizes of the two council areas. Also, Kinross has been paired with Glenrothes, but if it’s preferred, Kinross can be included in the South Tay seat in exchange for the East Neuk going into the Glenrothes seat. This area corresponds approximately to the old counties of Stirlingshire and Dunbartonshire. The two current Dunbartonshire districts are entitled to two seats between them, but Milngavie needs to be in the West seat because of the numbers. This leaves the East seat as rather an odd shape, but that is of little consequence. Stirling is split between a mainly north-of-the-river seat including Clackmannan and the Trossachs, and a southside seat going down to the small towns north of Falkirk. It is possible to have seat that includes all of Stirling, but that would mean the neighbouring seat would be slightly odd, combining Clackmannan with Denny and Stenhousemuir across the Kincardine bridges. This is a complex region covering the Lanarkshire and West Lothian council areas (except for Kilsyth). Every effort has been made not to split towns between constituencies, and this plan is successful when judged by that standard. Cumbernauld, Airdrie, Motherwell, Wishaw, Hamilton, East Kilbride and Livingston are not split between seats, except for a very small part of East Kilbride in the Lanark seat. One disadvantage of the plan is that Rutherglen is separated from Cambuslang. There’s a new “Strathalmond” seat (Bathgate & Shotts) formed by the area between the main towns. The decision has been taken to include Dumfries and Galloway council area in this region rather than with Ayrshire because the pattern of seats in the whole south of the country is better for it. Lochar ward is split so that the whole of Dumfries town is in the Dumfries seat. The east Dumfries-shire area is in a new “South Borders” seat, alternatively called Roxburgh, Ettrick & Annandale. Although there is no motorway from Lockerbie to Jedburgh, there is a community of interest across the Teviothead. The North Borders (Berwickshire & Peebles) seat is too small without part of Midlothian. The simplest arrangement is to add Penicuik and Loanhead. This side of Midlothian probably has more in common with Peebles than the other side of Midlothian (Dalkeith) has with Galashiels. 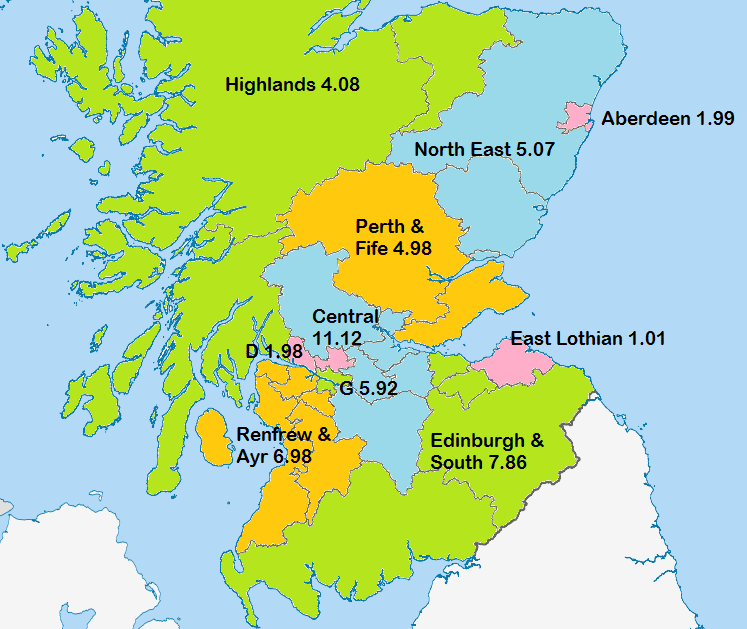 Edinburgh is entitled to 4.36 seats. There are three solutions to this problem. One is joining Edinburgh to East Lothian, but East Lothian is exactly the right size for a seat by itself. Another solution might be adding the Queensferry area to the Livingston seat, but there’s no room – so to do so would require rejigging a lot of constituencies. Finally, there is the possibility of crossing the Midlothian boundary. Liberton and Dalkeith make a reasonable combination. The main problem really is that in order to make up the numbers in the Midlothian seat, some of the Craigmillar ward also needs to be added. Although the pattern of wards in Edinburgh could be ignored, the suggested plan is an attempt to suggest a simple arrangement of seats based mainly on ward boundaries. There’s just one split ward (Leith Walk) in addition to the one mentioned already. All of Leith is in one coastal seat with Queensferry. This area comprises the six Ayrshire and Renfrewshire council areas. The South and North Cunninghame seats include part of Kyle and Inverclyde respectively. It is possible to form a North Cunninghame seat with Johnstone instead of Gourock (see here) but Johnstone and Arran would make slightly odd bedfellows. East Renfrewshire council area is slightly too small for a seat by itself. This could be resolved by adding a chunk of Paisley, but the more elegant solution is probably the one chosen: swap Johnstone and Barrhead between the two seats. The Paisley seat thus formed would be slightly over quota – this can be solved by removing part of Renfrew, or, preferably, by adding the Ferguslie Park area (which has good connections to Linwood) to the North Renfrewshire seat. Glasgow is entitled to slightly under six seats, but there is no pressing need for a city seat to include part of a neighbouring district. As with Edinburgh, ward boundaries could be ignored, but in most parts of the city they work well as constituency boundaries, and the latter can be tweaked further if necessary. There are three split wards: Craigton includes Kennishead from Newlands/Auldburn, Provan includes Royston from Springburn ward, and Scotstoun includes Kelvinhaugh from the Anderston ward. A spreadsheet of the proposals can be downloaded here. Note: an asterisk (*) next to an electorate total means that the seat includes both whole and part wards, and although the total is reasonably accurate based on the data currently available, it will be revised later as exact data comes online. Names in brackets are possible alternate names for constituencies. Locus gratefully acknowledges the invaluable help received from the Plan Builder online tool and the experts of the Vote UK forum.